Find the book at Random House and on Goodreads! And while you're at it, don't forget to visit Caitlin's website! After her tremendously successful book How To Be a Woman, Caitlin Moran is back with a collection of columns she's written for The Times Magazine in her appropriately named anthology Moranthology. Wading through a mishmash of different topics, mostly in the realms of popular culture, she also broaches more serious topics, such as living on benefits, or, my personal favorites, allows up-close-and-personal insights into her life, including how she got her trademark grey hair strand. 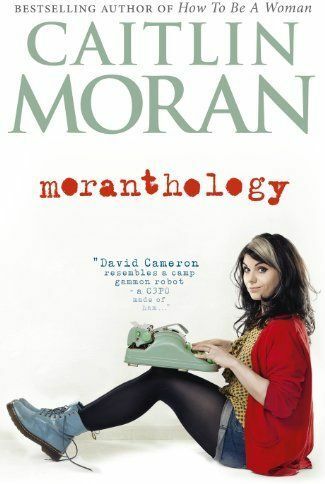 Topics may vary, some columns being more poignant than others, ranging from grave to funny, and always with a tendency of bordering on the vulgar, Moran's witty and eloquent writing style is definitely the red thread in this book. Little did I know this is a collection of older work and the only new additions are the short introductions to each column. Of course this presented the perfect opportunity to simply get to know her work better. Unfortunately though this book shares the fate of many anthologies - the likelihood that you will end up loving a handful of articles while the rest is just average padding between the covers, a padding that, in my case, consisted of an abundance of pieces about British TV series. Seeing how my expectations were high after her previous book, this collection was admittedly a bit of a let-down for me. However, this is simply a matter of personal preferences and should not discourage anyone giving this book a try. In short: A mildly entertaining anthology in typical Moran-style! Disclosure of Material Connection: I received this book free from Random House. I was not required to write a positive review. The opinions I have expressed are my own.